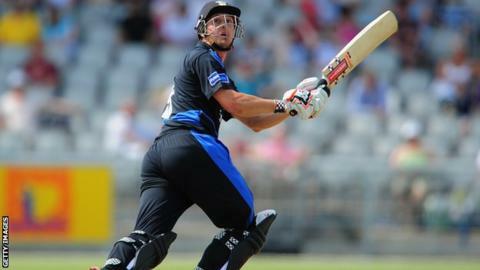 Durham wicketkeeper Phil Mustard has targeted a contract for the upcoming Twenty20 Big Bash in Australia. The competition includes eight teams, each allowed two overseas players in their 18-man squad, while a further two can be used if they become unavailable. Contracts must be agreed by 6 December and the tournament starts on the 20th. "Quite a few English lads have played in it these last few years so hopefully someone looks at my CV and decides it's good enough," he told BBC Newcastle. In the summer, Mustard became Durham's all-time leading run-scorer in 20-over cricket and has now hit 3,104 in 132 innings. Alex Hales (Adelaide), Craig Kieswetter (Brisbane), Dimitri Mascarenhas and Owais Shah(Hobart), Luke Wright (Melbourne Stars), Michael Lumb, Chris Tremlett and Ravi Bopara (Sydney Sixers), Eoin Morgan (Sydney Thunder). In but Durham refused to grant him permission amid security concerns. For the last two winters, he played for the Barisal Burners in Bangladesh's Premier League - another T20 competition - and hopes to do so again. "It has been a great experience so far and I did sign a three-year deal so hopefully Barisal honour that," added Mustard. "Ideally, I'd go straight over there from the Big Bash. I've put my hat in the ring even though it's probably a long shot - hopefully it comes through."